It was destination Blackburn for The Courteeners first of two warm-up shows, Getintothis’ Lewis Ridley was down the front to feel the heat. 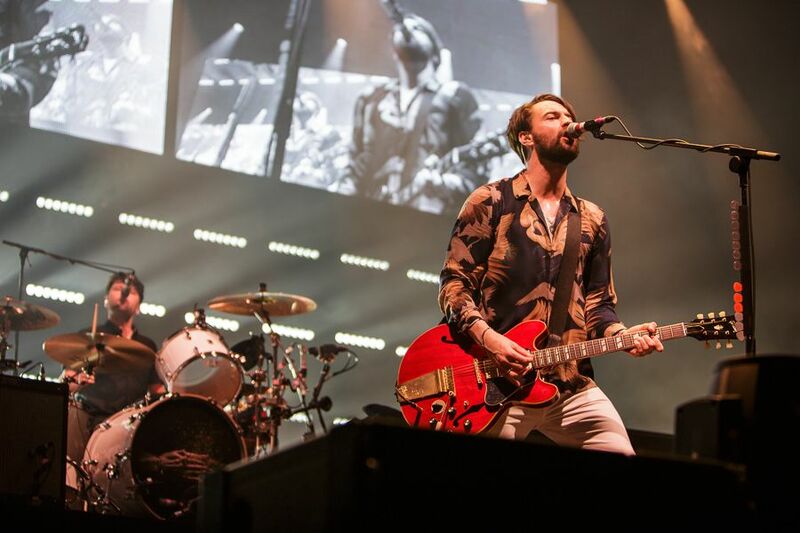 Liam Fray’s acoustic gigs last autumn provided a poetic respite from the usual chaos of Courteeners gigs, but it was clear tonight that fans were hungry for a different atmosphere as the band resumed service at Blackburn’s King George’s Hall. The Courteeners were preparing for two huge dates, at London’s Royal Albert Hall tomorrow (Friday, March 23) and Manchester Arena (Saturday, April 7). The former, in aid of the Teenage Cancer Trust, will be their debut headline show in the iconic venue. They’re remastering their debut album St. Jude to celebrate its 10th anniversary, having already released re:wired versions of both Not Nineteen Forever and Fallowfield Hillbilly. But fans were ensured that this set of gigs were to see The Courteeners plug back in and unleash that 2008 album in its entirety. Audrey Hepburn‘s face on the front of the band’s drumkit, from the artwork of St. Jude, was dusted off and ready for action. They always receive a terrace-like reception in the towns surrounding their native Manchester, such as Blackpool and Preston, and Blackburn was no different. When they stormed into Aftershow and adjoining B-side Kimberley, it was like a step back in time – and a showed a sense of how they’ve grown. If It Wasn’t For Me and Kings of The New Road reveal the snarling youthfulness that epitomised St. Jude while Liam‘s acoustic threefold offers a chance for the front man to pick out a few faces in the crowd that have helped them along the way. Though there’s always time to point out who didn’t fancy getting on board: “Since we’ve come back, magazines have been in touch… radio, RADIO? !” Fray said in a gap between songs. They have very much been a band that have belonged to their fans. The usual crowd-erupting Are You In Love With A Notion saw a packed King George’s Hall turn shades of red and green from smoke bombs held aloft. The ever-cool Conan can take in his work from the stage’s right-wing while Mark Campbell has the honour of watching the chaos unfold as he lets rip the intro of Not Nineteen Forever. For all the music-lovers that take sincere pride in looking down on The Courteeners, there are those who left King George’s Hall last night, and will return time and again to see a band who produce the goods time and again.